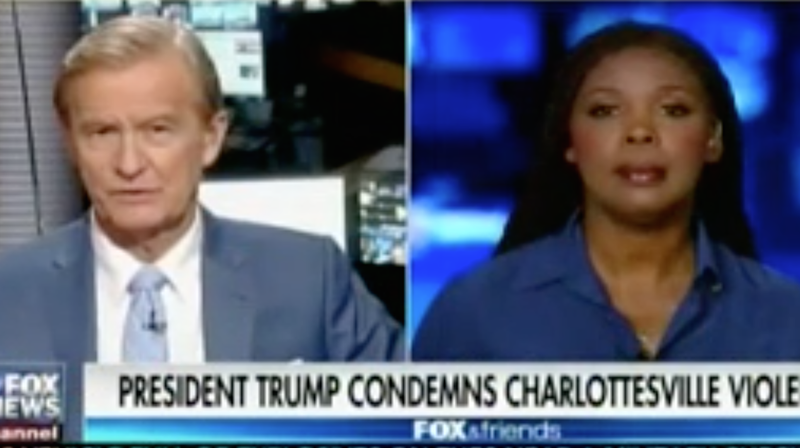 Disapproval over how Donald Trump failed to address the white supremacist violence in Charlottesville this weekend is so loud they even heard about it at Fox & Friends. In response, they invited Republican talking head and columnist Star Parker to share some more terrible ideas on air. Media Matters captured the interview, which starts out with Star Parker, a Republican who founded the Center for Urban Renewal and Education saying that the president’s remarks about violence from “all sides” on Saturday were sufficient. If there’s an alt-right, there must be an alt-left that’s just as dangerous, according to Parker. She does say that we should do our fighting in the voting booth rather than advocating openly for another civil war. But speaking of Civil War, what does Parker thing about the Confederate flag? That is not what happened. Nancy Pelosi is exploiting an opportunity that they think will play to their side. On Saturday, there were two sides that were in an American city that were — then it was escalating very rapidly. No, the question became then, well, do you denounce the one part of it? But you know what’s really interesting and really incredible irony here is the same people that are demanding that the Confederate flag comes down are the same people that are insisting that the rainbow flag goes up. These two flags represent the exact same thing. That certain people groups are not welcome here. So if Nancy Pelosi wants to say that we’re going to start shutting down First Amendment rights of a certain group of people, then what happens the next time that the homosexuals want to walk through an American city and protest and counter protesters come out?